I live in Ireland but often buy things from Amazon in the UK. I sometimes use services like Parcel Motel or AddressPal to buy items that won't deliver to Ireland. But it's also worth considering using these services to make a saving on VAT as well. This is because Amazon are required by the EU to collect VAT based on the country the customer lives in. So, for instance, if you want to buy a set of headphones for £299.99, and get them delivered to the UK, then you will pay £299.99. But if you get them delivered to an Irish address, then you will pay £306.48. That's nothing to do with shipping costs – both addresses can get free shipping – that's because of the extra 3% VAT charged to Irish consumers. When you think that Parcel Motel charges €3.95 at the moment to redirect a parcel from the UK to Ireland, you can still save a couple of quid. And if you're buying something really expensive, such as a top of the line Microsoft Surface Pro 4 for £1,799.99 it could cost you an additional £45 if it gets delivered to Ireland. But it's worth noting that if you do consider taking delivery through Parcel Motel, their standard insurance only covers parcels up to a value of €100. To increase the insurance cover you need to pay an additional €10.50 to get extended liability cover for €1,500. Last year An Post launched their AddressPal service to compete with the likes of Parcel Motel who offer a virtual delivery address in the UK. They recently upgraded the service to add a virtual delivery address in the USA, to allow people to shop for goods that are not generally available in Europe. After signing up, the service works by giving you a virtual address, which you then use as the delivery address for anything you order online or by mail order. The idea is then that An Post will ship on your item from the UK or USA to Ireland and deliver it either to your home or your local post office for collection. I signed up to the service last week in order to buy a new monitor from Amazon. I guessed that the box would be too big for any of the Parcel Motel lockers, so I thought I’d give AddressPal a try instead. The parcel got delivered to the English address at around lunchtime on the Friday. However if you use the service to deliver to a Post Office, then An Post offer no means of tracking the parcel’s progress. They don’t even acknowledge that they’ve received it. When I check the AddressPal site there’s no parcels listed against my account. This is something that An Post should look to introduce, to give customers some kind of reassurance that an item has been received. The AddressPal site says that it take 4-5 working days to be delivered on to the Post Office of your choice. That’s quite a long time to relocate a package from England to Ireland. Especially as it look less than 24 hours for the courier to deliver my monitor into the hands of An Post, and now it’s going to take up to a week for the onward leg. It’s now 3 working days on, and I’ve not heard anything. An Post only send an email and/or SMS out once the package is ready for collection at the Post Office – and that could be another couple of days from now. My email notification finally arrived after 4 working days saying that my parcel was ready for collection at my local Post Office. I had to leave work a little bit early to go there, as my Post Office closes at 5.30pm, which is a bit of an inconvenience. To collect the parcel I had to show the AddressPal card that that An Post had delivered to my house, together with a form of photo ID. I had to sign a screen to accept delivery, pay the €3.75 fee (cash or card is accepted), and the parcel was mine. It took just over 5 minutes in all, because I had to wait in line to be served, and then the woman serving me had to process my collection which took a couple of minutes in itself. Would I use AddressPal again? Maybe. I wasn’t overly impressed by the 4 working day wait to redirect from Britain to Ireland. And having to find a time to collect when the Post Office is open is not very convenient. Parcel Motel is quicker at delivering to the designated lockers (1-2 days), and you can pick up at any time, 24 hours a day. Parcel Motel is a great way to overcome delivery restrictions and outlandish courier costs when buying mail order in Ireland. The service gives you a virtual delivery address in Northern Ireland, and then redirects your parcel to a locker of your choosing for you to pick up in a 48 hour window. And with many UK retailers refusing to ship to Ireland, or charging expensive shipping costs, the fee of €3.95 of using Parcel Motel can seem like a bargain. Your parcel might be too big – the maximum size of the largest locker is 41 x 38 x 64 cm. If your parcel ends up being bigger than this (and bear in mind the amount of packaging Amazon normally uses) then you will be charged an additional fee of €7.00, and you will have to collect your parcel from your nearest Nightline depot – or pay even more for it to be delivered to your house. Your parcel might be too heavy – there’s a weight limit of 10 kg per parcel, and if you go over it you have the same charges as for big parcels. They also have something called a dimensional weight calculation which calculates weight based on size – check out the prices page for more on that. Your Amazon order might be split into several parcels – even if you select that you want everything delivered in one go during the Amazon checkout, they may decided to dispatch your order in two or more packages – and Parcel Motel will charge you for each one. Even if two packages for you arrive into Parcel Motel at the same time, they won’t put them in the same locker. Your parcel might take an extra 2 days to get to you – depending on the time of day that Parcel Motel receive your package, and also on how busy they are, it might take 2 days to reach your locker. So if you’re in a hurry, it might be worth paying the higher shipping costs to deliver direct (i.e. don’t use Parcel Motel). You might not collect your parcel in time – you have 48 hours from the time you are notified your package is in the locker to pick it up. If you miss this window, it will be removed from the locker, and it’ll cost you extra to get to it. Bear this in mind if you’re going away on holiday or business travel in the next couple of weeks, because a delay from Amazon in shipping may mean it arrives in your locker while you’re away. An alternate to Parcel Motel exists with a service from An Post called AddressPal. This service has the advantage of having an English virtual delivery address, instead of a Northern Ireland one, which is good for retailers who will only delivery to the British mainland. The AddressPal service allows you to collect your parcel from your local Post Office (which might have restricted opening hours) or get it delivered to your home. They also have a virtual delivery address in the USA. Update 19/03/2014: The Nexus 5 and 7 are now available to purchase SIM-free direct from the Google Play Store in Ireland. The Nexus 5 is also available as part of a contract from Three Ireland and Meteor. To access the Google Play store to order the phone you need to appear as if you’re in the UK. For this you need to use a VPN or Proxy service. I use VPNUK to access the play store, and they have a 7-day free trial if you want to give them a go – but any similar service will do – lots of other people seem to use “Tunnel Bear”. If you already have an active Google account, you may need to use the privacy/incognito mode of your browser, as sometimes the Google browser cookies will continue to identify you as being in Ireland even when you use the VPN. Have a UK delivery address ready to use. I use Parcel Motel for this, and you can use their Northern Ireland address for delivery – more info on using Parcel Motel. You need to have a credit/debit card that is registered to a valid UK address, but it doesn’t have to be the same address as you’re using for delivery. I’ve heard of people that re-register their Irish credit card with a UK address, use PayPal, or use a UK prepaid credit card, but I can’t comment on whether any of those work. The Nexus 5 is available in both Black and White, and is priced at £299 for the 16GB model and £339 model – and both come pre-loaded with the latest version 4.4 (KitKat) of Android. 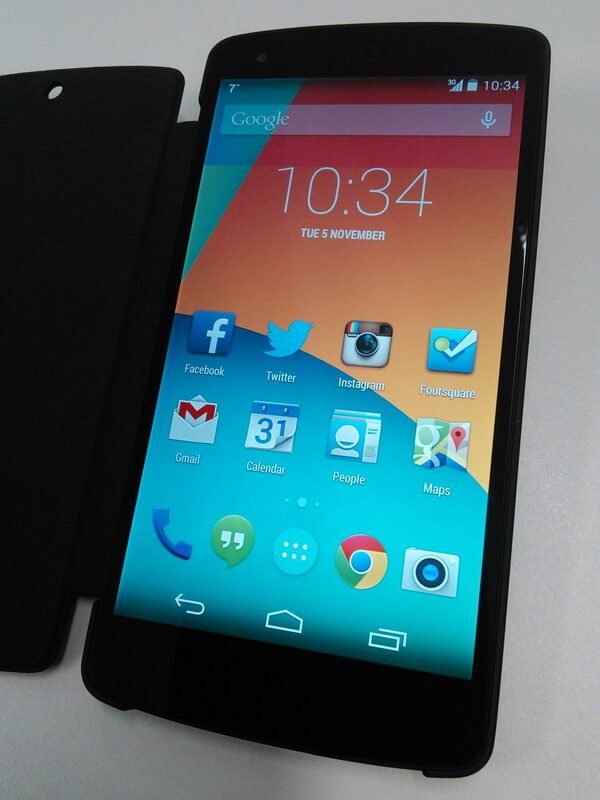 My Google Nexus 5 – just arrived today!